Kansas forward David McCormack (33) gets up to reject a shot from South Dakota guard Nathan Robinson (24) during the second half, Tuesday, Dec. 18, 2018 at Allen Fieldhouse. 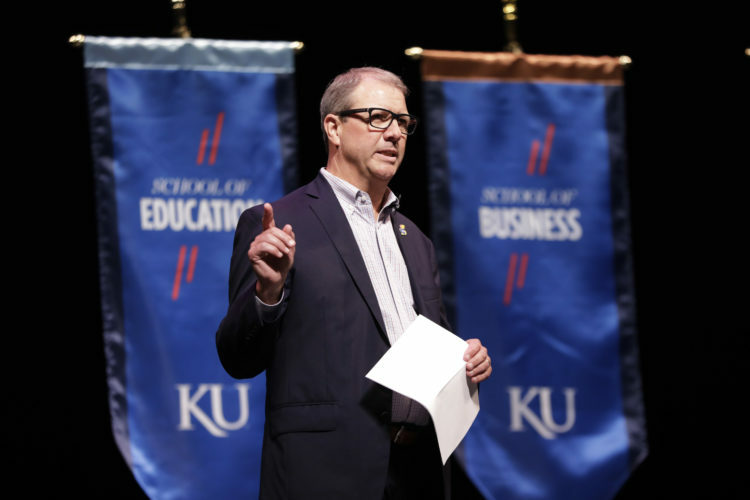 If Bill Self has to ditch the Kansas basketball team’s four-guard lineup, and the head coach puts two bigs on the floor versus Baylor on Saturday afternoon, Self will do so somewhat begrudgingly and not because he’s enthusiastic about a return to a traditional look. 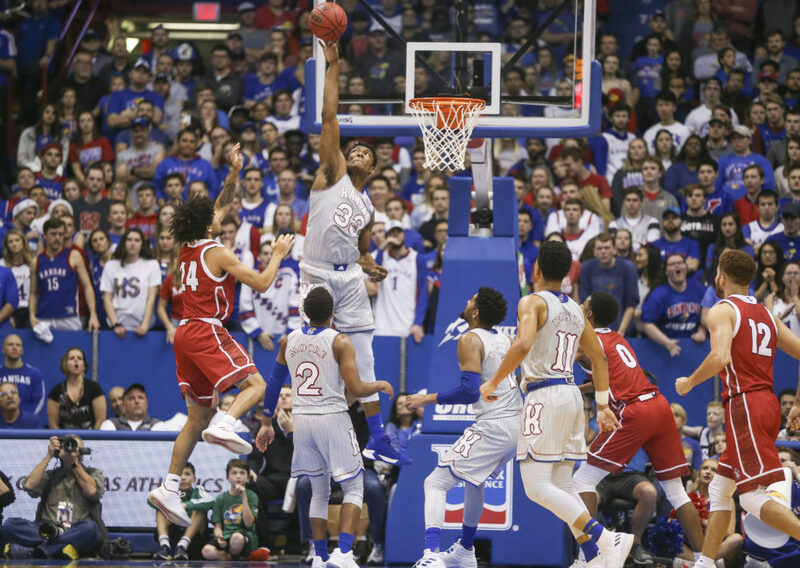 Asked following the Jayhawks’ home victory over TCU what he thought about a nearly six-minute stretch in the second half, when Dedric Lawson and Mitch Lightfoot played together, it brought about a visceral reaction from Self, his face grimacing in borderline disgust. “It was fine,” Self followed, with his reply. 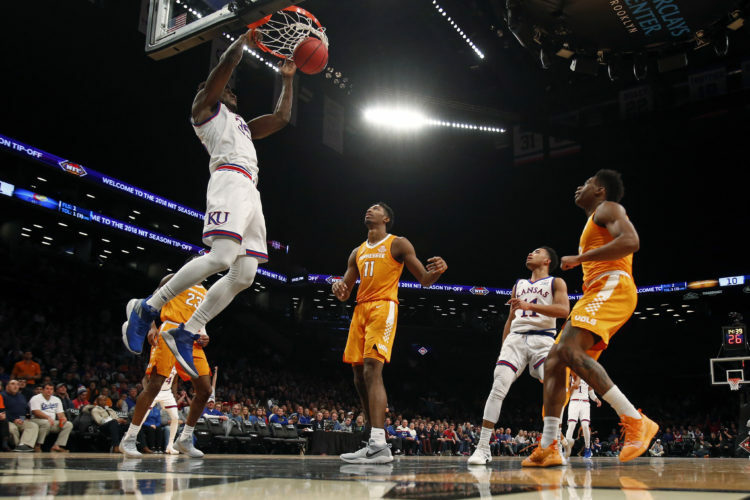 KU went big for a short stretch, the coach explained, because the Horned Frogs were cutting into the Jayhawks’ lead, narrowing it to two just before Self replaced K.J. Lawson with Lightfoot. Self hoped running some plays designed for two big men might provide a variant look, if not a spark. “And Mitch is the best we have to do that, to give Dedric a touch,” Self added. The No. 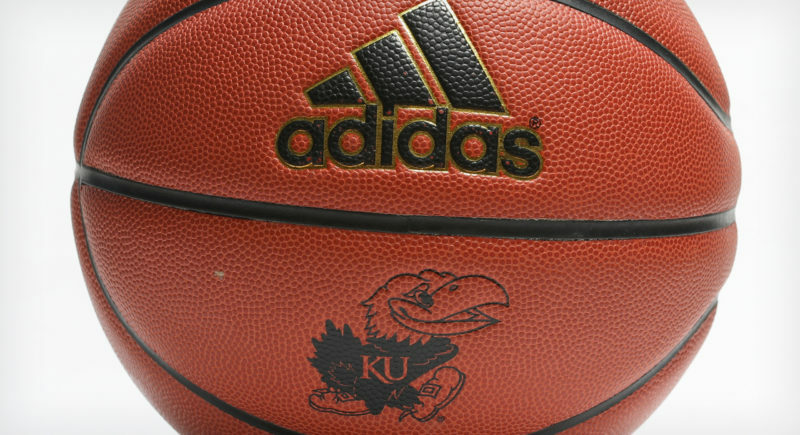 7 Jayhawks led 55-50 when Lightfoot subbed in at the 10:55 mark, and 66-59 when he checked out with 5:03 left to play. Lawson scored all 11 of KU’s points during the stretch, as the lead grew by two points. Not bad. But not great, either. Throw in TCU’s 3-pointer and a pair of layups during those five-plus minutes and you can see why Self wasn’t gushing about the experiment. Even so, Saturday’s matchup with Baylor (9-5 overall, 1-1 Big 12) means Self most likely will have to use two-big lineups to counter the Bears’ length within coach Scott Drew’s zone defense. This doubles as potentially great news for a couple of KU reserves: Lightfoot, who’s averaging 8.8 minutes a game this season, and freshman big David McCormack, who is averaging 6.7 minutes and only checked in for 34 seconds against TCU. Unless Dedric Lawson proves to be a zone dissector as a passer versus BU, and he’s able to hit cutting guards for easy looks, both Lightfoot and McCormack should get relatively extended runs as the other big on the floor. Self clearly trusts Lightfoot, a junior, more at this juncture of the season, but this could be a great opportunity for McCormack to gain some confidence and take another step toward proving he can handle more than what the coaches have asked of him up to this point. Both Lightfoot and McCormack are great providers of energy off the bench and solid rebounders. 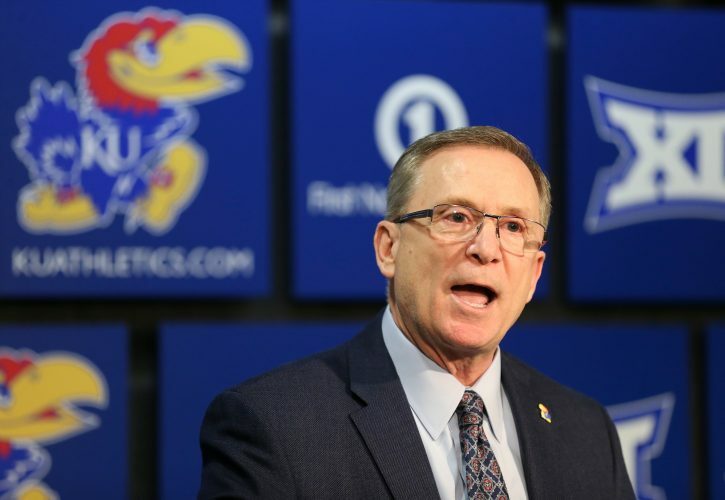 Self won’t ask them to do a ton offensively versus Baylor, but the Jayhawks very well could need both of the bigs to fill larger roles than usual, at least for one day.